Simple, elegant ceremony décor puts the focus on you and your beloved. Here, top event designer Sasha Souza shares some show-stopping designs. Soaring dogwood branches bring a touch of the outdoors in. 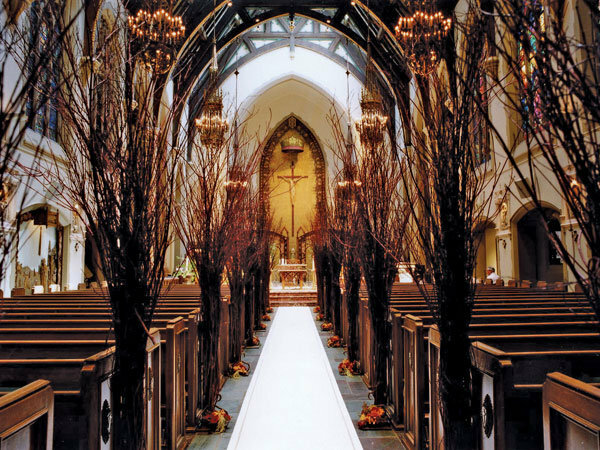 Clusters of roses and amaranth lie at the base of each 10-foot arrangement; a custom-painted runner finishes the aisle. A painted metal gate framing an antique urn is extended with arches and canopies, swagged with silk and covered in a riot of roses, hydrangea, amaranth, orchids and varietal greens. An airy arrangement of cherry and apple blossoms adorns this graceful iron huppah. Accenting the border of the aisle are loose petals and cymbidium orchids suspended in glass vessels. Coral & pink fabric echoes the pastel sand, while bamboo, netting, tropical blooms and leafy palm fronds play up the beachy vibe. Shell wind chimes tinkle in the Bahama breeze. Tall pillars swagged in colorful fabric are arranged to surround the couple and their guests, lending a sense of intimacy to the ceremony. Each pillar is topped with roses, orchids and moss. A leafy pergola overlooking a tranquil pond needs little more than a few strategic swaths of bold raspberry and sage draping, adding a pop of color to this free-spirited bohemian wedding. White roses and hydrangea suspended from branches of a towering oak tree create a natural arch. White silk, rose petals, crystal strands and chandeliers add to the wildly romantic appeal. A white silk-covered huppah topped with sprays of orchids stands in chic counterpoint to the rolling hills of this bucolic setting. Clusters of orchids hang below, in blue-tinted water. White rose petals form a fragrant carpet that leads to a bamboo ceremony structure adorned with roses, amaranth and orchid and draped in breezy lengths of celadon green fabric.